This was the 6th burger in the Las Vegas Burger Tour. Holsteins had been recommended to me by two Las Vegas chefs that I had spoken with on the previous day. Holsteins had opened in November of 2010, so it had been up and running for a little over 6 months when I stopped in. Holsteins had a burger heavy menu, and I had the opportunity to sample 5 of them. Since I didn’t want to orphan my son, Happy Meal, Chef Thomas Cullen arranged to prepare a selection of miniature burgers so that I could get a feel for each one without risking cholesterol toxicity. Even with a sample of 5 burgers, I still only managed to scratch the surface of the expansive and inventive 12-burger menu. Thomas Cullen, the assistant chef, exuded a level of confidence, regarding the quality of his kitchen’s output, which bordered on cocky. That is a strong quality in a chef. Cocky chefs take chances and make bold moves with food. We settled on a Turkey Burger, a Rising Sun (Japanese fusion), a Gold Standard (21-day dry-aged steak cuts), a Longhorn (with dry-rubbed, house-smoked brisket), and a Classic burger. 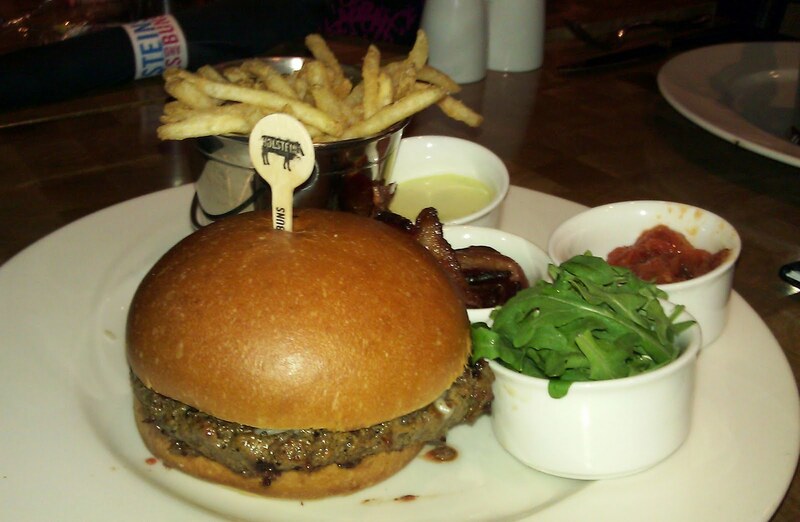 The Beef: The beef in the standard 8 ounce burgers was a mixture of dry and wet-aged cuts. 10% of the beef in the burger was 22-day dry-aged. This was a standardized blend of steak trimmings and 20% fat, which were ground by the supplier (Premier Meat Company) and delivered fresh daily. The Classic burger was a solid offering. The burger led with a strong taste of beef. It followed with the hearty mineral tastes and textures of the coarsely ground, chopped steak that it was. It was seasoned with simple salt and pepper. It was an honest and solid burger. Price: $13.50. The Longhorn burger was wonderful. The brisket was perfection, and it blended sweetly into the bite of ground beef without adding any chewiness. The crisp, cabbage slaw introduced just the right amount of earthiness and crunch to balance the tender brisket. Price: $16.00. The tempura avocado on the dauntingly seasoned Rising Sun burger was a revelation in texture…why doesn’t everyone serve that? It was genius. The flavors of that burger were the culinary equivalent of a knee to the face. It was delicious but also very intense. This is a burger that one should share--a full portion of this burger would have been overwhelming. Price: $16.50. The Gold Standard burger was aptly named. It was noticeably superior in both flavor and mouth feel to its Classic burger cousin. The 21-day dry-aging of he Sirloin came through on all of the expected fronts. It was far more tender than its less premium cousin. A pleasant funk was present. And, the flavor of the beef was mellower. It was dressed with a tasty Aged Goat Cheddar, which set this burger, and Holstein’s, apart in terms of selection of ingredients. The tomato confit was a nice touch as classed up version of ketchup. Price: $17.50. The Turkey burger was the only low point of the meal. The patty was a brick. It was 70% white meat and 30% dark. Without cutting in a lot of turkey skin, it would have been nearly impossible to cook it properly and not have it come out that way. To compensate, Holsteins dressed the hell out of the burger with a variety of wet toppings. Here’s a tip—don’t order turkey burgers…..ever. Price: $14.50. The Seasoning: The interior was left alone. The exterior the burger patties were dusted with kosher salt and pepper. The seasoning was spot on. Preparation: The kitchen employed both the grill and griddle when cooking the burger patties…the right way. Each item, which was sampled, was prepared with happy and exacting precision. The small bites were, in fact, fine dining on a bun. Flawless execution was the standing order in the kitchen of Holsteins. The Cheese: The cheese choices were numerous. American, Provolone, Goat Cheddar, and Gruyere comprised about half the list. The Goat Cheddar on the full-sized Gold Standard was mute. It was completely lost in the bun and beef. The Bun: The mini buns were a domed white flour/potato flour hybrid. These were just sweet enough, yeasty, fresh, and moist. They were delivered daily by Bon Breads. The bottom bun very competently served to catch all of the juices from the diminutive sampler burgers. The buns were right down the middle in terms of texture and flavor. They delivered without distracting. The full-sized buns were a cake-like brioche, and they were just sweet enough to balance out the savory elements in the burgers. Sadly, they were on the stale side when we revisited. The Meat To Bun Ratio: In the case of the miniature burgers, the ratio was precise. I took note of the full-sized burgers leaving the kitchen, and they were similarly proportioned. 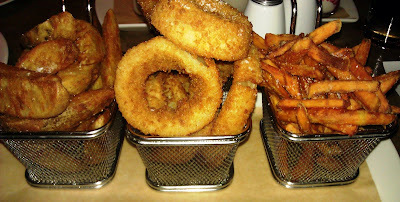 The Fries and Rings: The skinny fries, potato wedge fries, and onion rings were all Lamb Wesson products, so they arrived prepped and frozen. These were all cooked in neutral canola oil to a perfectly crisp golden brown. They were appropriately seasoned with flaky, kosher salt. The Cereal Bowl was a cereal milk shake with lots of Fruity Pebbles and Cap’n Crunch. It tasted like it its namesake. The Drunken Monkey was nicely banana-flavored with copious amounts of chopped Reese’s Peanut Butter Cups on the bottom. The Strawberry Cheesecake was a lot like it sounded. The shakes were a little less adventurous than the shakes at I Love Burgers, but they were delicious and flawlessly executed. The Desserts: The pastry chef sent out what appeared to be an entire candy store of single-bite confections. Most notable was the ridiculously cool, blue, bubblegum, nitrogen-frozen meringue. This was spooned by the server from a foggy bowl of liquid nitrogen—whee! These were popped into the mouth, and then the giddy fun began. The second the cryo-frozen meringue hit the tongue, the gas began expanding and this forced cold, nitrogen fog from the mouth and nose. 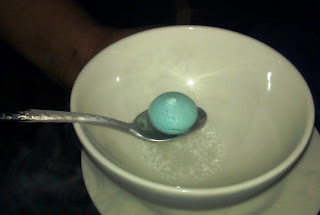 This coupled with the ethereal feel of the delicate meringue and its playful bubblegum flavor was just laughter-inducing fun. The berry push pop with the pistachio butter was quite nice, as well. 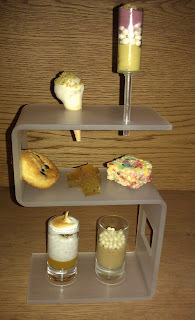 There was a clever playfulness present in the desserts, but the flawless execution was still in place. 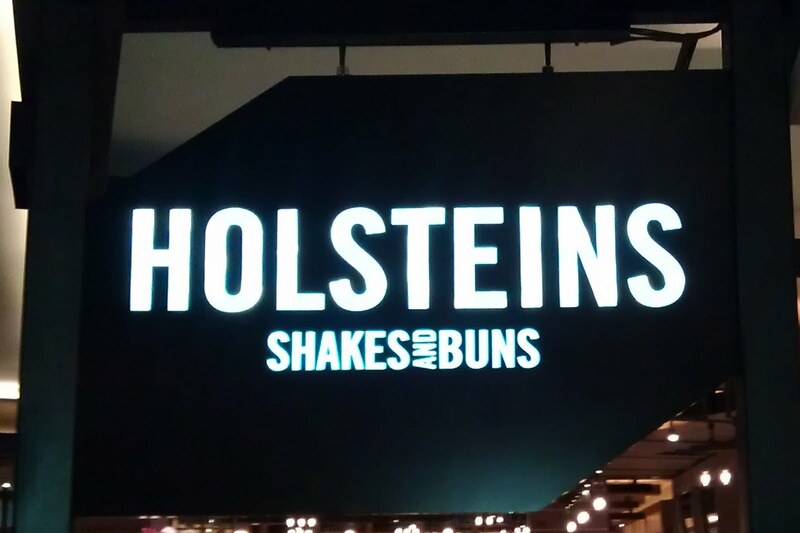 Holsteins was a next-level burger affair. The culinary talent in the kitchen was a force. The speed of innovation in the back-of-house exceeded the front-of-house's capacity to commit all of it to memory. Relentless improvement and adjustment via experimentation was the recipe for the tremendously fine burgers/food in general at Holstein's. The kitchen truly delivered something special in terms of fine dining, because they were able to deliver it on a humble burger bun. Burger Review : Fine dining on a bun. Holsteins needs to be on everyone's list of must-try burgers. In terms of execution and quality of toppings, this was the best burger in Las Vegas that I had found so far. Editor's Note: Happy Meal, the Marinater, and I revisited Holsteins on 04JUL11. Chef Cullen had departed the previous week, and his absence was already felt. The burgers were quite good, but the precision of the previous visit was now lacking. The buns were a little too dry. The crusts were leathery. The burgers were a little over-cooked. Both came out closer to Med-Well than Med-Rare. The Gold Standard burger ended up being on the dry side. 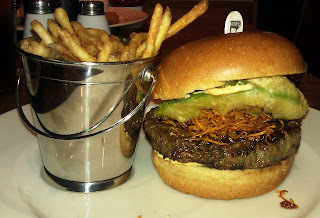 The yam on the Rising Sun burger was cloying, and it overwhelmed the subtle Kobe beef and the sublime tempura avocado. That tempura avocado was tremendous on the previous visit, and it was a shame to see it lost in the dish on this try. The meager portion of the Goat Cheddar on the Gold Standard burger was invisible to the palate. The burgers were darn good in terms of the flavor of the beef, but they no longer tasted of relentless perfection. The ingredients no longer worked in perfect harmony. The value of the Gold Standard burger and the Rising Sun burger at Holsteins were weak. A burger that came in at $17.50 should have been flawlessly prepared. Better burgers for better prices could be located easily and within walking distance of Holsteins. I had noted that recently, a spate of unfavorable reviews had come out regarding the service, quality, and pricing at Holsteins. That was sad, because this place had a terrific start. I do hope that they get their act together.